Read a transcript of the listening session at the White House after the Parkland school shooting. 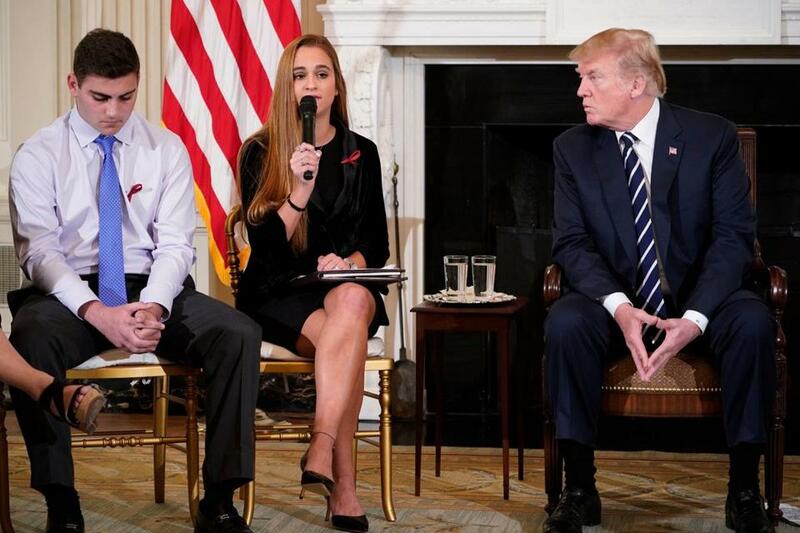 President Trump watched as Julia Cordover, student president at Marjory Stoneman Douglas High School in Parkland, Fla., spoke at the White House. The White House released a transcript of the listening session that President Trump conducted Wednesday survivors, family members, and teachers from the school shooting in Parkland, Fla. THE PRESIDENT: Thank you very much. Have a seat. It’s a great honor to have you here, and we’re going to be listening to some of your suggestions. I’ve heard some of them, and we’re going to do something about this horrible situation that’s going on. And we’re going to all figure it out together. So I want to listen, and then after I listen, we’re going to get things done. I thought we’d start off -- Pastor, if you could possibly say the prayer, it would be appreciated. Thank you. THE PRESIDENT: Thank you very much, Pastor. Appreciate it. Vice President, you wanted to say and I’d like you to say a few words. And I’d like to then introduce you to Betsy DeVos, who most of you know and some of you have met a little while ago. Mike, what do you have to say? THE VICE PRESIDENT: First off, thank you, Mr. President. I want to thank the families from Parkland for being here, and assure you of the deepest condolences and sympathies of the First Family and our family, and of the American people. As the President said last week, the American people are united with one heart, broken by what took place. But the President called this meeting for us as much to talk about what’s happened in our country over the last 20 years, and to find out from all of you gathered here, by listening, by learning, how we might ensure that this is the last time this ever happens. I, along with the President, are deeply moved by the stories of heroism and courage. And I’m candidly moved by the courage that it takes for many of you to be here today. And what I just want to encourage you to do is tell us your stories. America is looking on. And your President, our entire administration, leaders around the country at every level are looking on. And we want to hear your hearts today. I encourage you to be candid and be vulnerable, and share with us not only this personal experience, but what it is that you would have us to do. And just know that as the President has already taken action, he’ll be meeting in this very room in the coming days with governors from all 50 states to make school safety the top priority of this administration and across this country. The President and I wanted to hear from you all first. And so I want to say thank you for coming, thank you for the courage and being willing to be here and share your hearts. And just, from our family to your family, just God bless you and comfort you. THE PRESIDENT: Thank you, Mike, very much. Betsy. SECRETARY DEVOS: Thank you, Mr. President. Students, teachers, parents: Thanks for being here. For many of you, you’ve lived through something unthinkable. For many of you it’s raw and fresh. I admire your strength and bravery to come share your experience with the President, the Vice President, and the world. No student, no parent, no teacher should ever have to endure what you all have. And my heart is broken. What happened last week shocked us, it angers us, and it pains us. We are here to have an earnest conversation about why this tragedy, and too many others before it, happened, and how we can work to find solutions. We’re here to listen, to gain your important perspective on ways to reduce violence and to protect students. Our hope is that by talking and by listening, we can make something that was unthinkably bad, something good. And your loss and your trauma must never be in vain. So thank you again for being here, and let’s get started. THE PRESIDENT: Thank you very much, Betsy. And I just want to say before we really begin -- because I want to hear your input -- we’re going to be very strong on background checks. We’re going to be doing very strong background checks. Very strong emphasis on the mental health of somebody. And we are going to do plenty of other things. Again, next week, the governors are coming in from most of the states, and we’re going to have a very serious talk about what’s going on with school safety. Very important. And we’re going to cover every aspect of it. There are many ideas that I have. There are many ideas that other people have. And we’re going to pick out the strongest ideas, the most important ideas, the ideas that are going to work. And we’re going to get them done. It’s not going to be talk like it has been in the past. It’s been going on too long; too many instances. And we’re going to get it done. So, again, I want to thank you all for being here. And I’d like to hear your story. And I’d also like to, if you have any suggestions for the future based on this horrible experience that you’ve gone through -- I’d love to have those ideas. How about we start with you. MS. CORDOVER: All right. Thank you, Mr. President, for having me here. My name is Julia Cordover, and I’m from Stoneman Douglas High School, and I was there during the shooting. And I am a survivor. And I want you guys all to emphasize the point that I survived. I was lucky enough to come home from school, unlike some of my other classmates and teachers. And it’s very scary. And knowing that a lot of people did not have this opportunity to be here still is mind-blowing. And I’m just -- I feel like there is a lot to do, and I really appreciate you hosting me and what you are saying. I’m confident that you’ll do the right thing, and I appreciate you looking at the bump stocks yesterday. That means it is definitely a step in the right direction, and I think we can all agree on that. There’s definitely a lot more to go, but I am just grateful that I’m here and that we can try to work out something. Maybe compromise on some solution so this never has to -- no child, no person in this world will ever have to go something -- through so horrific and tragic. And my thoughts and prayers are out to everyone there. So, thank you. THE PRESIDENT: I really appreciate it. MR. BLANK: Hello, my name is Jonathan Blank. I go to Stoneman Douglas, and I was actually in the second classroom that was shot at. In my mind, as a kid, nothing ever that horrible should ever have to happen to you. You can’t even think about it. It doesn’t even seem real still. Everything seems fake. I can’t even -- I don’t even know what’s going on. It’s just crazy, everything happening. It’s just so tragic. Thank you for everything. You’ve done a great job, and I like the direction that you’re going in. Thank you. MRS. BLANK: My name is Melissa Blank. Jonathan is my son. And I am a teacher’s aide at Westglades Middle School that was also on lockdown. So I couldn’t get in touch with my son to find out if my son was alive or not. I feel for all of these families. My heart is just broken for my whole community. We’re coming together. I feel for all the families who have lost, and I feel for the ones that are here because we now have almost a guilt like I have. Why not my child? Which I feel bad saying I’m happy that he’s here with me. But I feel so bad for all of you who have lost so many. And I’m just begging for a change. We need a change. MRS. ABT: Do you mind -- may I pass the microphone back to my daughter, because I think she has some nice solutions and -- if that’s okay with you. MS. ABT: Hi, my name is Carson Abt. I am a junior, and I was at Marjory Stoneman Douglas at the time of the shooting. And I know there are a lot of different solutions that we can go through to help eradicate this issue, but one that stuck out to me was about all the drills and protocols that my teachers had to go through. They knew what to do once the code red for an active shooter was announced. But, through research, I found that only 32 states require drills. But of those 32 states, more than half of the counties do not go through the drills because they want to spend their resources towards something else. And I know that a bill was also passed that declared that each school has to go through one drill each month. But I know that my school, we go through fire drills every month, and we have not had our lockdown drill yet this year. And I think a change that will increase all of the trainings and protocols, so if God forbid another shooting does happen, at least all the teachers will be prepared and can hopefully keep their students calm. THE PRESIDENT: That’s great. Thank you very much. Thank you. MS. KLEIN: Hi, my name is Ariana Klein. I would just like to say thank you for leading this country. You’re a great leader, and I appreciate the direction that the country is going in. I’m a junior; I attend Stoneman Douglas. And I just want to say that everybody right now is so stuck on what they believe, that they’re not even listening to what other people believe. We need to listen to the other points of views. We all need to realize that we all have different points of views and that we need -- this solution is not going to be a singular thing. It’s going to be multi-faceted and it’s going to be created by a collection of different people working together. And we all have to realize that we all have our opinions, and together we’re going to be able to work to a solution. And this is not just Parkland anymore, this is America. This is every student in every city, everywhere. It’s everybody. It’s not small. It’s everything. And I’d just like to say thank you for having us. THE PRESIDENT: Thank you. I appreciate it. MR. ABT: My name is Fred Abt. I’m Carson’s dad. I’m going to pass the microphone along to some of the other students. If we have a chance later on, perhaps I’ll speak or other parents could speak. But I’d like students to get their chance. THE PRESIDENT: Thanks. Very nice. MR. GRUBER, JR.: My name is Justin Gruber, and I was at the school at the time of the massacre. I’m only 15 years old. I’m a sophomore. Nineteen years ago, the first school shooting, Columbine -- at Columbine High School happened. And I was born into a world where I never got to experience safety and peace. There needs to be a significant change in this country because this has to never happen again. And people should be able to feel that, when they go to school, they can be safe. And -- because there needs to be a change -- I’m sorry. People need to feel safe. And parents shouldn’t have to go through the idea of losing their child. As I know, from my dad, he was panicking and he couldn’t imagine it. So that shouldn’t even be a possibility that should go through a parent’s mind. There needs to be some change. Thank you. MR. GRUBER, SR.: I’m Cary Gruber, Justin’s dad. And I’ll be brief. You know, Justin was texting me, hiding in a closet, saying, “If something happens, I love you. If something happens, I love you.” And you can’t imagine what that’s like as a parent. And then his phone died, and I didn’t know what happened for another hour or so. So, 17 lives are gone. I was lucky enough to get my son home, but 17 families -- this is -- it’s not left and right, it’s not political. It’s a human issue. People are dying. And we have to stop this. We have to stop. If he’s not old enough to buy a drink -- to go and buy a beer, he should not be able to buy a gun at 18 years old. I mean, that’s just a common sense. We have to do common sense. Please, Mr. Trump, these are things we have to do. In Israel, you have to be 27 years old to have a gun. You’re only allowed one. They tax the guns. You have to go through significant training. We got to do something about this. We cannot have our children die. This is just heartbreaking. Please. Thank you. MS. MORRIS: Hi, my name is Shannon Morris. I’m a local administrator for a school in D.C., and I really want to continue the conversation for our students. MS. MARCUS: Hi, my name is Vielka Marcus, and I’m also a local educator here in Washington, D.C. for Friendship Public Charter Schools. So I will allow our students that are here to voice their opinions, as well as give some of their ideas to do that at this time. And my condolences and my heart truly go out to not just the families that have lost children in this horrific, horrific incident that has occurred, but also to our families here in the District of Columbia that experience gun violence outside of our schools that directly impact our schools because they are our students. MS. BARNETT: Hello. My name is Alaya Barnett, and I go to the Friendship Technology Preparatory Academy in the heart of Southeast D.C.
My condolences to every family here that experienced the shooting and all the students that experienced that. And I’m here on behalf of my school and all of the Friendship Schools in D.C. to be able to prevent those kind of things happening at our school. Because in Southeast D.C., we do encounter a lot of violence and things -- most of the time at night, but a lot of the times it’s in the daytime too. So our schools, we do take preventative measures and everything to stop that. Like, we check bags at the door and everything. And it does make us -- at first, we’re like, “No, we don’t want to do this.” But then we realize it’s for our safety. But we wanted to make sure that it continues and that nothing can ever slip up for these things to happen like in school. Counseling for our students who are struggling with fear and bullying. Bullying triggers emotions that would make a student want to bring a weapon to school to protect themselves or to get revenge for a person that did something to them. So we just want to have a lot of preventative measures to be in the schools -- and also outside of school -- to make sure that nothing can happen to us while we’re in school. MAYOR HUNSCHOFSKY: Hello, Mr. President. Thank you for having us. I’m Christine Hunschofsky. I’m the mayor of the city of Parkland. We have a great city. It’s been one of the safest cities in America. And the fact that this happened in our city means it can happen anywhere. We are blessed that we are a very close-knit, family-oriented city, and our community is coming together. We lost 17 lives, but the ripple effects throughout the community are devastating. I have spent the last week going to funerals -- friends of mine that lost their children. We have to, at some point, care enough and be strong enough to come up with solutions. And I hope we will. And if I might, I had two parents who lost children this past week text me some of their thoughts, if I might share them with you. MAYOR HUNSCHOFSKY: Thank you. I spoke to Jennifer and Tony Montalto. They just buried their daughter Gina yesterday. And their comments were -- so Tony is a airline pilot. And he said he supports the Second Amendment, but he does not believe there is a need for assault rifles. He also said that the FBI, there were signs missed. And it reminded him of 9/11. So we do have to work on making sure that our protocols are in place so that people don’t slip through the cracks, literally, in this case. We also talked about the red flag laws. I think there’s a little progress being made in Florida now on the red flag laws, which is, when somebody shows signs of hurting themselves or someone else, you can take their gun away from them. Fred Guttenberg, a service for his daughter Jaime was last week, on Friday. And he would like the administration to publicly acknowledge the role of guns. Now, these two parents talked about guns, and there are absolutely lots of areas where there’s room for improvement -- lots of areas -- from mental health, from teacher training. But also -- part of that is also the gun issue. So it’s not that it’s just those and not the gun; it’s all of them. And in the debate world, in the high school debate world, the kids talk about when they bring up legislation, you want to have impacts. You’re not bringing up legislation that doesn’t have a positive impact. And what is the positive impact of having legislation that stops assault rifles -- bans assault rifles? It could save a life. And that needs to be a priority in any case. And when we talk about rights -- so we have the right for free speech, but if free speech in any way endangers someone, it gets restricted. And I think -- I appreciate that we’re coming here to listen, and I appreciate that we’re coming here to look at all different perspectives, because we need action and we need to be solution-oriented. THE PRESIDENT: Thank you. Appreciate it. Thank you. MR. POLLACK: We’re here because my daughter has no voice. She was murdered last week, and she was taken from us. Shot nine times on the third floor. We, as a country, failed our children. This shouldn’t happen. We go to the airport -- I can’t get on a plane with a bottle of water. But we leave it -- some animal can walk into a school and shoot our children. It’s just not right, and we need to come together as a country and work on what’s important, and that’s protecting our children in the schools. That’s the only thing that matters right now. Everyone has to come together and not think about different laws. We need to come together, as a country -- not different parties -- and figure out how we protect the schools. It’s simple. It’s not difficult. We protect airports. We protect concerts, stadiums, embassies, the Department of Education that I walked in today that has a security guard in the elevator. How do you think that makes me feel? In the elevator, they got a security guard. I’m very angry that this happened, because it keeps happening. 9/11 happened once, and they fixed everything. How many schools, how many children have to get shot? It stops here with this administration and me. I’m not going to sleep until it’s fixed. And, Mr. President, we’re going to fix it, because I’m going to fix it. I’m not going to rest. And look it, my boys need to live with this. I want to see everyone -- you guys look at this. Me, I’m a man, but to see your children go through this, bury their sister. So that’s why I’m keep saying this, because I want it to sink in, not forget about this. We can’t forget about it. All these school shootings, it doesn’t make sense. Fix it. It should have been one school shooting and we should have fixed it. And I’m pissed, because my daughter I’m not going to see again. She’s not here. She’s not here. She’s in North Lauderdale, at -- whatever it is -- King David Cemetery. That’s where I go to see my kid now. And it stops if we all work together and come up with the right idea. And it’s school safety. It’s not about gun laws right now; that’s another fight, another battle. Let’s fix the schools, and then you guys can battle it out, whatever you want. But we need our children safe. Monday, tomorrow, whatever day it is, your kids are going to go to school. You think everyone’s kids are safe? I didn’t think it was going to happen to me. If I knew that, I would have been at the school every day if I knew it was that dangerous. It’s enough. Let’s get together and work with the President and fix the schools. That’s it. No other discussions. Security, whatever we have to do -- get the right people, the consultants. These are our commodities. I’m never going to see my kid again. I want you all to know that. Never, ever will I see my kid. That’s how -- I want it to sink in. It’s eternity. My beautiful daughter, I’m never going to see again. And it’s simple. It’s not -- we could fix -- this is my son Huck, who has to deal with this too. You have something to say, son? MR. HUCK POLLACK: I just want to add that it’s imperative to the safety of everyone to support the free market and free flow of ideas, and listen to people on -- listen to radical opinions on both sides. And that’s how we’ll find solutions. You let people battle it out in a free flow of ideas. Censorship has got to stop. And that’s how we find the solutions, by listening to everyone, having an open mind. MR. POLLACK: This is my son Hunter. MR. HUNTER POLLACK: How are you? I’m Hunter Pollack, class of ‘15, Marjory Stoneman Douglas. I walked the same hallways where Meadow got shot and all 16 other victims. First off, I want to thank Mr. President for having us. We had a very effective meeting before we walked in this room. Mr. Vice President, as well, and Madam Secretary, I put all of my trust into them and my father that, together, that we’ll be able to find a solution. And that’s all I have to say. Thank you for having us. MR. ZEIF: Hi, my name is Sam Zeif. I’m a student from Marjory Stoneman Douglas in Parkland. And I just want to take a second first to thank you for having me, Mr. President, Mr. Vice President, Madam Secretary. I was on the second floor in that building, texting my mom, texting my dad, texting three of my brothers that I was never going to see them again. And then it occurred to me that my 14-year-old brother was directly above me in that classroom where Scott Beigel was murdered. Scott Beigel got my brother in the class. He was the last kid to get back into that class. And I’m sure a lot of you have read my texts on the Internet with my brother. I didn’t plan for them to go viral. I just wanted to share with the world, because no brothers, or sisters, or family members, or anyone should ever have to share those texts with anyone. And that’s why I’m here. I lost a best friend, who’s practically a brother. And I’m here to use my voice because I know he can’t. And I know he’s with me, cheering me on, to be strong. But it’s hard. And to feel like this -- it doesn’t even feel like a week. Time has stood still. To feel like this, ever, I can’t feel comfortable in my country knowing that people have, will have, are ever going to feel like this. And I want to feel safe at school. You know, senior year and junior year, they were big years for me, when I turned my academics around, started connecting with teachers, and I started actually enjoying school. And now, I don’t know how I’m ever going to step foot on that place again, or go to a public park after school, or be walking anywhere. Me and my friends, we get scared when a car drives by -- anywhere. And I think I agree with Hunter and Huck, and how we need to let ideas flow and get the problem solved. I don’t understand. I turned 18 the day after. Woke up to the news that my best friend was gone. And I don’t understand why I could still go in a store and buy a weapon of war -- an AR. I was reading today that a person, 20 years old, walked into a store and bought an AR-15 in five minutes with an expired ID. How is it that easy to buy this type of weapon? How did we not stop this after Columbine, after Sandy Hook? I’m sitting with a mother that lost her son, and it’s still happening. In Australia, there was a shooting at a school in 1999. And you know, after that, they took a lot of ideas, they put legislation together, and they stopped it. Can anyone here guess how many shootings there have been in the schools since then in Australia? Zero. We need to do something, and that’s why we’re here. So let’s be strong for the fallen who don’t have a voice to speak anymore. And let’s never let this happen again. Please. Please. A parent from Newton, Conn.
MS. HOCKLEY: Mr. President, Mr. Vice President, Madam Secretary, my story is far too well known. I had two sons who were at Sandy Hook school. My eldest, who was eight at the time, survived. And my 6-year-old son Dylan did not. And I have been working tirelessly on this issue for over five years now. The organization that I help lead, Sandy Hook Promise, is very focused on keeping kids safe at school -- because no parent should go through this. Every parent who sends their kid to school should know, without any question in their mind, that they’re going to be coming home that day. This is not a difficult issue. You’re absolutely right. There are solutions, and this administration has the ability to put them in place. And after Sandy Hook, they said we wouldn’t let this happen again, and yet it has continued to happen for five years. How many more deaths can we take as a country? How many more teenagers and six- and seven-year-olds can we allow to die? Don’t let that happen anymore on your watch. There are things that you can do right now. Mental health, you mentioned earlier; funding for that would be very much appreciated. The STOP School Violence Act, enabling prevention programs and reporting systems in schools across America. It’s already passed through the House. It’s in the Senate right now. Urge swift passage right now. That can get a lot of help to schools. I absolutely agree, since Sandy Hook, there has been an increase in school safety and security. We’ve invested a lot on the bricks and mortar of our schools; we’ve invested a lot on the security of our schools. I think we also need to focus on prevention. How do we prevent these acts from happening? How can we help identify and get help for people who are at risk of hurting themselves or others before they pick up any weapon? That’s what we need to focus on, by preventing these acts. And you have the ability to do that. There’s legislation available to you right now. There are free training programs, such as our Know the Signs Programs, available across the states. Right now, you could mandate these sorts of programs. You could ensure that schools, students, and educators are trained how to recognize these signs and to know what to do when they see them, and then to ensure that those tips are followed through. This is not difficult. These deaths are preventable. And I implore you, consider your own children. You don’t want to be me. No parent does. And you have the ability to make a difference and save lives today. Please don’t waste this. Thank you. MR. SCOTT: Mr. President, Vice President, and Mrs. DeVos, thank you for inviting my wife and I to be here today. I’m a little bit weak; I had surgery last week, so I’m kind of weak in voice and body. But 19 years ago, I went through what some of the folks here are going through now, because my beautiful daughter Rachel was killed. And my son Craig was in the library that day, and two of his friends were murdered beside him. He lay there covered in their blood, looking down the barrel of two guns aimed at him. And he knew he was going to die. And a split second before Eric and Dylan pulled the trigger, the alarm system went off and it distracted them, and they never came back to the table where Craig was at, or I would have lost two children that day at Columbine. So my heart goes out to you, sir, and to every one of you that have experienced the trauma that you’ve gone through at Parkland. Our focus has been -- my beautiful wife, the most beautiful lady in the room is right there, in the blue and white blouse, Sandy. We started a program called Rachel’s Challenge, and it was started a year after Rachel died. And we have worked with some wonderful partners over the last few years. We work closely with Chuck Norris and his wife Gena in a problem they call Kickstart for Kids. We work with Cal Ripken, Jr. and his brother Bill, and have created a program for athletes called The Uncommon Athlete, and it’s based on something my daughter wrote in one of her diaries. We have partnered with Dr. Robert Marzano who’s one of the top K-12 researchers in the country, and a program called WhyTry -- all dear friends -- and another program called Love and Logic, Dr. Jim Fay -- one of the largest parenting programs. All of us combined our efforts together. Our organization has reached over 28 million students in the last 19 years, and we have seen seven school shootings prevented. We see an average of three suicides prevented every single week of the year -- over 150 a year. I have a little book with me that I’d like to leave with you. It’s got letters from students. We don’t edit them. These are emails from students who were planning to commit suicide. And we see three of those every single week -- students that have changed their mind. And if you don’t mind, I just want to share one simple principle with you that we’ve learned over the years as we’ve worked with millions and millions of young people, and it comes from something you said last week in your speech. And it was that we must create a culture of connectedness; we must create a culture in which our classmates become our friends. That’s something we’ve learned how to do over the years. We have over 28 different programs, and we see children connect with one another. Every single one of these school shootings have been from young men who are disconnected. And we talk a lot about the mental health issues, but it actually goes deeper than that because there’s a lot of mentally ill children that are kind and compassionate. And so we work with those children every single day of the year -- of the school year, but there’s always the one with the propensity to violence. And so one of the things we have learned -- and we train young people and we train teachers -- that the focus must not be just on unity or diversity. Because if you focus too much on diversity, you create division. If you focus too much on unity, you’ll create compromise. But if you focus on relatedness and how we can relate with one another, then you can celebrate the diversity and you can see the unity take place. I’m all for diversity, I’m all for unity, but the focus really needs to be on how can we connect. And that’s something that we and our organizations have learned. One thing we have learned is how to connect students with each other, with themselves, with their teachers, and with their parents. And I would love to share more as we have a chance to do so. Thank you again for having us today. THE PRESIDENT: Thank you very much. I appreciate that. This is an incredible group of people, and we really do appreciate it. Some of the folks in the back, and some of my friends sitting right back here, I’d like to have you say a few words. We can learn a lot from you. We want to learn everything we can learn, and we’re going to go -- starting about two minutes after this meeting, we’re going to work, because this is a long-term situation that we have to solve. We’ll solve it together. And you’ve gone through extraordinary pain, and we don’t want others to go through the kind of pain that you’ve gone through. It wouldn’t be right. So would you like to say something, please? MR. KELLY: Thank you, Mr. President. My name is Curtis Kelly. I represent Thurgood Marshall Academy here in the District of Columbia. Thank you, Vice President and Madam Secretary, for having myself and Gregory Baldwin, who represents Thurgood Marshall. My tragedy started September the 20th of last year. I have two twin sons that attend Thurgood Marshall, and they are elite athletes, junior Olympics. One of my sons was the youth council member for the District of Columbia in Ward 5. And one day he was -- this is after school. Now, we need to -- I agree we need to protect our kids in schools, but we need to protect them on their safe passageways home as well, and their extracurricular activities, and their parks and recreations, and everything, that they try to go for their peace in. So my son, Zaire Kelly, went to college-bound -- right after school -- to announce that he was declaring for his college to run track and to further his education, and become mayor of the District of Columbia, or something like that. On his route home, he got a text from my son, Zion Kelly, who was going to make it, but when he found out there was press, he decided not to. Because, locally, we were burnt by the press. Zion is texting Zaire, “Watch out, there’s someone in our passageway coming home.” And in a split second, Zaire was just walking home, maybe from this distance to where the curtains are -- he was that close to home -- when a thug came out to try to rob Zion, and he tried to rob Zaire. He tried to rob Zion 20 minutes earlier. He came back because he was upset, he didn’t get them students. “Those fast track kids -- I’m going to come back and get them.” He went, caught my son, got in an altercation over a cell phone, and shot my son in the head. And now he’s not here with us. That day, I could have lost two sons. But the tragedy that my family have to live with after losing Zaire is -- I have another son that attends Thurgood Marshall. He’s -- we’ve been taking him to all types of family counseling and therapy. And the school has been affected. The community has been affected. And the local politicians say, “So what we want to do is stand up for our students in the community, give us some solutions as to what we can do.” So myself, along with helping hands in D.C., came together and got with attorneys. And everyone else said, okay, we’re going to do some research and find out what legislation can be found that can better serve to protect our students in their safety zones and their school zones. And it’s been a fight, because everybody show up for photo ops. All the politicians show up to say, “We going to get it done. We going to protect our kids.” But just a couple weeks later, a school shooting, just like we all hearing about all these experiences, at Ballou Senior High School -- a kid gets shot at school. Dunbar -- a kid gets shot in school. In our schools, on their safe passageway home. Their parks and recreations, extracurricular. Our students have to be protected. Our students have to be protected. One local legislator asked me, how do you define students? How would a criminal define students? You would define them after you commit a crime against them. The students are crying. They’re calling for a national stand-out day, April the 20th, in celebration of Columbine -- because the same incidents keep happening not just in our schools -- in our communities, as well -- to upstanding citizens, to those that’s doing the right thing. And we as parents, yes, we’re trying to fight to pass legislation just like you, locally. But nationally, this campaign has grown and it’s affecting all of us, all our kids, this gun violence -- gun violence. So I thank you. That’s my story. And we’re going to keep fighting, and we’re going to keep trying to pass legislation, and we’re going to keep fighting for our students at Thurgood Marshall, and here in the District of Columbia and across America as well. THE PRESIDENT: Thank you very much. It’s incredible. Very sad. Thank you very much. Does anybody have an idea for a solution to the school shooting, and the school shootings that we’ve gone through over the years? And we’ve seen too much of it, and we’re going to stop it. We got a lot of different ideas. I could name 10 of them right now. Does anybody have an idea as to how to stop it? What is your recommendation to stop it? MR. ABT: I don’t know if I’m going to say something you haven’t already heard. You know, I could tell you that, in addition to all of the sorrow that we are feeling in our community right now, there’s also a lot of anger. Anger that the police can visit a person dozens of times and not take action. Anger that the FBI could get at least two credible tips and not take action. And one possible solution, which we’ve discussed with Secretary DeVos over lunch, was, if a tragedy strikes, can we wait for the first responders to get to the campus four, or five, or six, or seven minutes later? And one possible solution, which may not be very popular, would be to have people in the school -- teachers, administrators -- who have volunteered to have a firearm safely locked in the classroom, who are given training throughout the year. There are plenty of teachers that are already licensed to carry firearms. Have them raise their hands to volunteer for the training. And when something like this starts, the first responders are already on campus. And if it’s not the teachers, you could have people that work on the campus. A custodian could be an undercover policeman. Someone who works in the library or the lunchroom could be an undercover policeman. He serves lunch every day, but he also has a firearm at the ready. A guidance counselor. If you can’t stop it from happening, and with hundreds of millions of guns out there, I don’t know if it will ever be fully stopped. But the challenge becomes, once it starts, to end it as quickly as possible. MR. ABT: Yeah, anonymously. I don’t want the kids to know who have the firearms. I don’t want the shooters to know who have the firearms. I don’t want people walking around with firearms on their side. But when that alert goes off, and they put the kids in the closets, and they put the kids under the desks, then I want the teacher to open that safe, pull out that firearm, and be ready to do what needs to be done while you’re waiting for the helicopters and the SWAT teams to come. MRS. BLANK: 3,200 with one deputy? One. And if that deputy leaves for a training, we need another deputy there. MRS. BLANK: And the other thing is communication. Your schools have to communicate with the police. The police has to communicate with child services. Child services maybe has to communicate with FBI if there’s a -- and for someone to bring -- to buy a gun at 18, to do, I understand like even a background in 15 minutes -- you should be able to communicate with all of those other people that something is wrong and this child doesn’t belong -- to buy a gun like this. THE PRESIDENT: You’re right about that. Yes, go ahead. PARTICIPANT: Mr. Vice President, Madam Secretary, thank you for having us. I think what you’re hearing today is, there’s no lack of solutions. I think what we’ve had today is a lack of leadership. And I have confidence that you will bring out that leadership that we need to finally take the action that needs to be taken, because there’s not one solution; there’s many solutions. And you’re hearing some of those here today to resolve this, to address this. Our schools are soft targets. So we need to harden the targets by making -- increasing our deterrence capabilities so that a potential murderer knows that that’s not going to happen; that there’s going to be people there ready to respond. That the minute something happens, our technology will pick up that an incident has occurred, and there will be a response immediately. And then also the children and the teachers know what to do in that instance -- so if they’re communicated with effectively. What we need to identify is where are the mental issues among the student population. The kids at the school knew this person. They knew he was an issue. The FBI knew, and I think we need to close some of these loopholes in the background check system where we’re not integrating effectively the mental health knowledge that exists at the state level, at the local level, into the federal background check system. So, fix the NICS system. And that’s an easy one. So there’s a lot of immediate steps we can take right now; there’s some longer-term solution. But I think we need to get started right away. And I thank you for your help on this. THE PRESIDENT: Well, thank you, too. And I will say, again, background checks are going to be very strong. We need that. And then after we do that, when we see there’s trouble, we have to nab them. You know, years ago, we had mental hospitals -- mental institutions. We had a lot of them, and a lot of them have closed. They’ve closed. Some people thought it was a stigma. Some people thought, frankly, it was a -- the legislators thought it was too expensive. Today, if you catch somebody, they don’t know what to do with them. He hasn’t committed the crime, but he may, very well. And there’s no mental institution, there’s no place to bring them. And we have that a lot. Even if they caught this person -- I’m being nice when I use the word “person” -- they probably wouldn’t have known what to do. They’re not going to put them in jail. And yet -- so there’s none of that middle ground of having that institution, where you had trained people that could handle it and do something about it and find out how sick he really is. Because he is a sick guy. And he should have been nabbed a number of times, frankly. Your concept and your idea about -- it’s called concealed carry -- and it only works where you have people very adept at using firearms, of which you have many, and it would be teachers and coaches. If the coach had a firearm in his locker when he ran at this guy -- that coach was very brave. Saved a lot of lives, I suspect. But if he had a firearm, he wouldn’t have had to run; he would have shot and that would have been the end of it. And this would only be, obviously, for people that are very adept at handling a gun. And it would be -- it’s called concealed carry, where a teacher would have a concealed gun on them. They’d go for special training. And they would be there, and you would no longer have a gun-free zone. A gun-free zone to a maniac -- because they’re all cowards -- a gun-free zone is, let’s go in and let’s attack, because bullets aren’t coming back at us. And if you do this -- and a lot of people are talking about it, and it’s certainly a point that we’ll discuss -- but concealed carry for teachers and for people of talent -- of that type of talent. So let’s say you had 20 percent of your teaching force, because that’s pretty much the number -- and you said it -- an attack has lasted, on average, about three minutes. It takes five to eight minutes for responders, for the police, to come in. So the attack is over. If you had a teacher with -- who was adept at firearms, they could very well end the attack very quickly. And the good thing about a suggestion like that -- and we’re going to be looking at it very strongly, and I think a lot of people are going to be opposed to it; I think a lot of people are going to like it -- but the good thing is that you’ll have a lot of people with that. You know, you can’t have a hundred security guards in Stoneman Douglas. That’s a big school. That’s a massive school with a lot of acreage to cover, a lot of floor area. And so that would be, certainly, a situation that is being discussed a lot by a lot of people. You’d have a lot people that’d be armed. They’d be ready. They’re professionals. They may be Marines that left the Marines, left the Army, left the Air Force. And they’re very adept at doing that. You’d have a lot of them, and they’d be spread evenly throughout the school. So the other thing -- I really believe that if these cowards knew that the school was well-guarded, from the standpoint of having, pretty much, professionals with great training, I think they wouldn’t go into the school to start off with. I think it could very well solve your problem. So we’ll be doing the background checks. We’ll be doing a lot of different things. But we’ll certainly be looking at ideas like that. You know, a lot of people don’t understand that airline pilots now, a lot of them carry guns. And I have to say that things have changed a lot. People aren’t attacking the way they would routinely attack. And maybe you have the same situation in schools. So does anybody like that idea here? Does anybody like it? Right? Yes. For Meadow -- your beautiful Meadow. We talked about that. And do people feel strongly against it? Anybody? Anybody? Strongly against it? All right. I mean, I could -- look, we can understand both sides. And certainly, it’s controversial. But we’ll study that along with many other ideas. Anybody else something to say? Yes, go ahead. MR. SCOTT: I’ve been in thousands of schools across America, and I’ve noticed in Israel they have one-guard entry points. And it’s very well guarded. I’m not asking for us to (inaudible). I’m not saying we should turn our schools into prisons. But I’ve been in so many schools where I’m speaking in an auditorium, and I’ll go outside to call my wife or to just get a breath of fresh air, and it is so easy for me to get back into that school. I’m an unknown adult to many of those students. I can tap on a window, and they’ll open the door for me. Or I can catch someone coming out the side door and easily get in. So one of the things that I have thought a lot about in seeing this around the country is we have really soft entry points into schools. THE PRESIDENT: That’s true. That’s true. And we can do something about that. MR. THOMPSON: Good afternoon. I’m Brandon Thompson. First, my heart goes out to everyone who’s experiencing this tragedy right now. I’m currently dean of students at Friendship Tech Prep, which is in the heart of Southeast D.C., which is in Ward 8, which is one of the most impoverished wards in D.C.
And so we oftentimes use that TSA model. When a student comes in, we have somebody at the door to greet them to do a check in just to see how they feel. And we have certain point people, where I know this person is not feeling so well, so they won’t get past point one. They go through the metal detector, their bag goes through the machine. And so, at the end of the day, just talking to my students riding over today, they all say, “Well, I feel safe.” And you come outside and you said talk about mental hospitals -- our school is right across the street from a shutdown mental hospital. We have -- you know, if you were to come over to the streets, you would be like, “Oh my God.” But once you get inside the building, we have that family feel. We have those check-in points. We have it where every visitor that comes through our building has to go through these checkpoints to ensure that our students get home safe, to ensure that our staff members get home safe. And these are just minor solutions. Like, I will say, I’m against having a teacher with a gun in the building. Teachers are emotional. People are emotional. So I think that is a huge factor, however. But having students -- and you may have to go to staff members -- going through these checkpoints to ensure that, one, their mental is on point; and two, that we’re talking about they don’t have any physical metal on them and/or -- even our building, our students don’t even carry cell phones because we consider that’s a threat. It’s taking away from them learning. So they actually turn in their cell phones. And so those things of ensuring our kids are there at the moment, to live the moment, to enjoy school -- they get that joy factor. They get that family feel. And they’re able, now, to connect with one another and able to communicate, and not have to worry about looking over their shoulder when they walk out and into the building. Because they know every person that comes through the building has been through a metal check -- their bags have been checked. And so that’s just a solution. Once again, my heart goes out to everyone who has been through this tragedy. THE PRESIDENT: Thank you. Very well said. Very well said. Yes. MS. HOCKLEY: Mr. President, thank you for being open to hearing all forms of solutions. I truly appreciate that. One point on the mental health issue -- and I think it’s important to note that someone with a mental illness is highly unlikely to ever commit an act of violence. It’s a very, very small percentage. What we’re really dealing here is more of the lack of mental wellness. This is around anger and fear. And that’s not something that you can diagnose and put in mental health hospitals. This is more about funding for mental health services to help these individuals that are at risk, especially when we think about suicide, teen suicide. Suicide is the number two killer of our children as I understand right now. And a lot of these suicides are performed with firearms, which makes them unsaveable. So the idea of mental health and being able to identify who’s at risk, who’s considering these issues, who’s going into crisis, that is incredibly important. I appreciate the point on arming teachers. It’s not, personally, something that I support. Rather than arm them with a firearm, I would rather arm them with the knowledge of how to prevent these acts from happening in the first place. How do you identify the kids in your class that are most at risk? And then, most importantly within a school, how do we have a safety assessment program so that schools know how to deal with all these threats; have established protocols to deal with them, and get underneath the surface of what’s going on in that child’s life; find out why they’re on this pathway behavior and intervene? This is about prevention. There are some fabulous solutions being talked about today, which still go to imminent danger. Let’s talk about prevention. There is so much that we can do to help people before it reaches that point. And I urge you, please, stay focused on that as well. It is the gun, it’s the person behind the gun, and it’s about helping people before they ever reach that point. THE PRESIDENT: Yes, go ahead. Thank you. MR. ZEIF: So I fully respect all of our amendments, including the Second. But in Maryland, they have proven that the Second Amendment does not protect these types of weapons. They have banned over 45 different kinds of assault weapons, including the AR. Including the AR. They have banned -- they have limited magazine sizes. They have proven that it’s not like we have to lose our Second Amendment. You know, these -- the Second Amendment, I believe, was for defense, and I fully respect that, like I said. But these are not weapons of defense; these are weapons of war. And I just -- I still can’t fathom that I, myself, am able to purchase one. MR. HUNTER POLLACK: I would like to talk, Mr. President. I couldn’t agree -- I’m not here to debate, but I lost my sister. And like Mr. President said, if you could find 20 percent of maybe retired law enforcement officers or teachers that could go through discreet training to carry a firearm on his waist, it could have been a very different situation. Like he said, law enforcement, it takes them seven minutes, eight minutes, to get there. If a teacher or a security guard has a concealed license and the firearm on their waist, they’re able to easily stop the situation, or the bad guy -- I’ll but it that way -- would not even go near the school knowing that someone can fight back against them. Also, I believe that is insanity that they would even open the gates up 20 minutes before school ends. They’re supposed to protect us and the children. So in the future, we need more security, we need more firearms on campus, we need better background checks, and we need to study more on mental health. And I want to thank everyone for their condolences. And that’s my only argument. Thank you. THE PRESIDENT: Thank you very much. Thank you. MR. LAWRENCE: Well, thank you, Mr. President, Mr. Vice President, Madam Secretary for having us here. My deepest condolences for those who have -- deepest condolences for those who have lost family and friends. My name is Curtis Lawrence. I’m the principal at Friendship Collegiate Academy. And like Mr. Brandon had said, we have security and we also have MPD on staff that we hired to make sure that things aren’t coming into our school, and also, immediately in the mornings and during dismissal, immediately around the school to protect our kids as they leave. But last month, we did suffer a loss. One of our ninth graders was gunned down walking distance from the school. And so when we talk about safe passage, I think in looking at what’s happening with gun violence, with our scholars and with our students, I’m saying take a double approach, right? You have to protect kids that are in schools. All right, so as a President you have different laws in different states, and so definitely where they don’t have the necessary security as we may have with getting in, then we have to think of what are those solutions for the kids in Florida that are going to those schools with that to make sure that they’re safe in school. And then in places like here in D.C., what are those solutions to make sure kids are able to get home and to school safety? So I think it’s a two-prong approach and I know you have a specific position to -- as you meet with the governors, and they have their different laws and coming from these different perspectives to make them own that two-prong approach to protect them in school and protect as well out of school, going back and forth. MR. BARDEN: Mr. President, thank you so much, and thank you, Vice President and Madam Secretary, for convening this and for allowing us all the opportunity to speak about this very serious problem. And my heart absolutely breaks for the families of Parkland. I have a sense of what you’re going through now. I have been going through it for five years. This is my son Daniel. He was seven years old when he was shot to death in his first-grade classroom in Sandy Hook Elementary School just a little over five years ago. My wife, Jackie, could not be here today because she’s a schoolteacher and she takes that job seriously, and sent me as the ambassador. Jackie is a career educator and she will tell you -- she has spent over a decade in the Bronx -- and she will tell you that schoolteachers have more than enough responsibilities right now than to have to have the awesome responsibility of lethal force to take a life. (Applause.) Thank you. Nobody wants to see a shootout in a school and a deranged sociopath on his way to commit an act of murder in a school with the outcome -- knowing the outcome is going to be suicide, he’s not going to care if there’s somebody there with a gun. That’s their plan anyway. I am going to build on what my friend and colleague, Nicole Hockley, said. We tried this legislative approach. I’ve been in this building before, many times, wringing our hands, pleading with legislators, “What can we do?” Until we finally said, well, we have to go home and do this ourselves. And we built something. Sandy Hook Promise has built something that works. We train students and we train teachers and we train educators with the tools, how to recognize these people, and with the tools of how to intervene, and with the tools to get them to the help that they need before they pick up a gun or any other weapon and commit a horrible tragedy. It works. We don’t charge for it. We’re not asking for money. We’ve already stopped school shootings. We’ve already prevented suicides. We’ve already captured other social issues like bullying and cutting. We know that it works. We have a solution right here. We’re asking for you to please help. We need to do this nationally, now. Thank you. THE PRESIDENT: Thank you, Mark. Thank you. SECRETARY DEVOS: I’d like to take the opportunity to thank you and the Vice President, and to thank everyone here for joining us today, for telling your stories, for sharing your perspectives. And please know that this is the beginning of a long conversation. We are committed to seeing a solution to this very, very tragic and horrible situation. And so, know that our hearts will continue to be with all of the families affected here. And thank you again for being with us today. THE PRESIDENT: Thank you, Betsy, and thank you, Mike, and thank you everybody for being with us. We’re going to work very hard. It’s very difficult, it’s very complex, but we’re going to find a solution. We have been looking at this issue for a long time -- too long as far as I’m concerned. And you’ll be back -- you’ll be back in a much more positive light. We will get there. If you have any suggestions, if you have any feelings as to what we should do -- because there are many different ideas -- some, I guess, are good. Some aren’t good. Some are very stringent, as you understand. And a lot of people think they work. And some are less so. But in addition to everything else, and in addition to what we’re going to do about background checks -- we’re going to go very strongly to age, that’s age of purchase, and we’re also going to go very strongly to the mental health aspect of what’s going on. Because here was a case where he cried out -- this person was sick, very sick. And people knew he was very sick. And I know law enforcement is also -- I really learned a lot from this -- we’re also going to look at the institutions. We’re going to look at what to do when you find somebody like this -- because again, right now we’re not equipped like we were many years ago. So we’re going to look at that whole aspect of what’s going on. I want to thank everybody. I know you’ve been through a lot. Most of you have been through a lot -- more than you ever thought possible. More than you ever thought humanly possible. And all I can say is that we’re fighting hard for you, and we will not stop. We will not stop. We’re going to get there. And I just grieve for you. I feel so -- it’s just, to me, there could be nothing worse than what you’ve gone through. Again, thank you for your ideas. Thank you for your thoughts. Thank you for pouring out your hearts, because the world is watching. And we’re going to come up with a solution.